As with most trades, baking in Colonial America was patterned after English bakeshops or bakehouses. But it was not until the emergence of cities and towns that professional bakers became firmly established in America. As towns grew in size and number and as the frontier expanded westward, commercial bakeries multiplied accordingly. Within a few decades of the founding of Jamestown, Plymouth, and New York, several commercial bakeries were started in the colonies, as early as 1640 in Plymouth and 1645 in New York. Other early settlements were supporting professional bakers by the end of the century. Growth was slow, though. For example, in 1776, New York bakeries numbered only twelve compared to seven for the year 1700. Bakehouses were usually low, square buildings with windows looking straight out to a river. Bakers worked long, hard hours for comparatively small profits. Work in a country bakery usually started at 5 a.m. with the firing of the oven. After heating the oven, the next job was to make up the dough to add to the sponge, which had been left overnight to ferment. As for kneading, lumps of dough were torn off and flung upon the scales, and it was surprising how frequently an experienced man could remove exactly the amount to make a loaf. 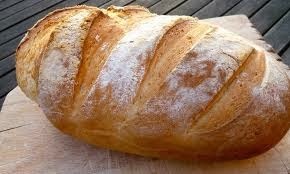 Loaves were made in two sizes, and in early times were not baked in tins. Dough rested for about 30 minutes, during which time rusk biscuits were made and there was a tea break. Using long-handled wooden spades known as peels, the loaves were put in the baking chamber to bake for one hour. 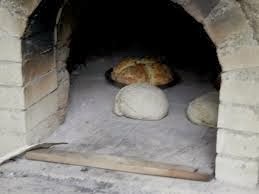 After the first batch was cooked and removed, the baker would stoke up the oven again and make it ready for more bread, buns, or doughcakes. When the day’s baking was done, preparations were made for the evening work—gathering the flour and dissolving yeast in warm water to make the sponge. Because bakehouses were warm, in the wintertime they became places for people to gather and socialize or places for travelers to stop and get relief from inclement weather. In my home state of South Carolina, rice was the colony's great staple and it was served with meats and shellfish and used to make breads, biscuits, flour, puddings, and cakes. Corn served all classes to make Johnny cakes as well as hominy. Wheat was grown by some of the Germans in the interior, but better grades were imported from Pennsylvania and New York. Lowcountry dwellers grew and enjoyed a variety of fruits: oranges, peaches, citrons, pomegranates, lemons, pears, apples, figs, melons, nectarines, and apricots, as well as an array of berries, which were baked into muffins and breads. Here's a recipe for the popular Benne Seed Cookies baked in colonial times in South Carolina. Benne or sesame seeds were brought from Africa to our South by slaves. As they hoed the cotton, they dropped the seeds at each end of the rows, making a border of benne plants. Also, the seeds were scattered over doorsteps to bring good luck. The seeds were roasted and used extensively in desserts and candies. Cream butter until soft and pliable. Gradually beat in sugar until mixture is soft and fluffy. Beat in egg until mixture is smooth. Sift flour, baking powder, and salt together; stir into creamed batter. Add vanilla and benne seeds; stir until well blended. Drop teaspoonfuls of batter far apart on buttered cookie sheet; bake in preheated oven at 325 degrees 12-15 minutes, or until lightly browned. Makes about 4 dozen cookies. Nom! Bread baking is one of my favorite parts of the holiday! Great post! Thanks, Karla. I learned how to make cinnamon rolls, too. YUM. Going to have to run a marathon at the end of the holidays! A great post, Susan. I'm making spoon-bread for breakfast as I write this. Recently, a friend came to my house to teach me, my granddaughter, and another friend how to bake bread from a starter. There's something therapeutic about kneading dough. We had such a good time, and my house smelled heavenly. My friend always gives her bread away to the homebound in our church and others who need cheering up. I left California in 1976 and brought some sourdough starter. I'm still making sourdough bread and English muffins. forgot to say, love the benne recipe. Is this the same as bennewafer? Yes, Kathleen, it's the bennewafer. Thanks, Kathy. It's fun to run across descriptions of everyday living. It's those little details that fascinate me and draw me into a novel. Absolutely wonderful post, Susan! Thanks so much! Love all these details! Wonderful post Susan, being a baker of goodies I so love learning things about history that deal with areas of my life now. I am reading Stones for Bread and you might love that book, 18 artisan recipes for breads in there ! I so love novels and novellas to that touch on things we do today and the womens lives back then.